On a trip to Toronto for the TAVES audio show, we got chatting to two guys from Montreal, Pierre and Stéphane, who owned a company called Bluewave. What they were showing was a single product: a tiny little portable headphone amp called the GET, designed to make any pair of headphones wireless. While the concept itself wasn’t new, we like the look of the product, and eagerly accepted their invitation to take it with us as we wandered the show floor. In this review, we break down the Bluewave GET’s sound, design, packaging and accessories, specs and more. To see alternatives, read our list of the best headphone amps. The big selling point for the Bluewave GET is the level of high-quality sound it’s capable of dealing with. It handles not only standard Bluetooth (up to 5.0), but aptX and 24-bit aptX HD, running sample rates of up to 48kHz. On the product page, Bluewave state that “Your headphones will sound better plugged into GET than plugged directly in your phone.” We think they’re being a little too modest. Don’t get us wrong: the sound isn’t going to blow your head off. It’s not life-changing. The king of portable amps is still arguably the FiiO Q5 (full review here), which is light years ahead in terms of sound quality. But for a small, independent product – one that costs $129, compared to $350 for the FiiO – we were genuinely surprised at how good the sound quality was. It had a level of richness and depth to it that we didn’t expect, showcasing music in the best possible light. The low end had real weight, and it’s clear that inside the tiny body, the circuits were working very hard indeed to provide power. Bluewave claim the amp is capable of powering headphones with impedance up to 600 ohms – check this out if that doesn’t make sense – and although we didn’t have headphones that ran quite that high to test it out, we did have a pair of 250 ohm Beyerdynamic Amiron Homes (full review) to try. The GET didn’t even break a sweat, getting a more than reasonable volume at around two thirds of the max. It did struggle a little bit more with the planar magnetic models we tried out with on the floor at TAVES, but not by much – we never had any real problems. Well, we did have one problem: the phone calls. When we tested these, they felt a little bit too loud, even distorted. It was going to be one of the few black marks against the sound, but shortly before this review was published, Bluewave’s Pierre Lelievre told us that “we lowered the level of incoming phone calls comparative to the music in the firmware we ship with. It was a concern for some.” So, that’s alright then. And ultimately, the GET sounds a lot better than it has any right to. A product that’s smaller than a credit card shouldn’t have enough juice to make a pair of Beyerdynamics dance, but it does. The sound signature isn’t going to leave your jaw on the floor, but is capable enough that you’ll never find yourself having buyers remorse. And again, we keep coming back to the price: for what you’re getting here, $129 is a steal. Our current favorite to use with the amp, by the way, is the remarkable Venture Electronics Monk+. Best $10 we ever spent (seriously, they’re amazing, buy a pair). The Bluewave GET is designed and built entirely in Montreal, Quebec, and is very clearly an independent production. It has the air of a piece of crowdfunded technology, and that is, in fact, exactly what it is: the company recently raised $130,000 via Indiegogo to design and build the GET. There’s nothing here that’s been focus-grouped. Everything feels cheerfully homebrewed, from the slightly gawky looking design to the nerdy shirt clip. The GET is a tiny little device, no more than a couple of inches long and barely half an inch wide, which is designed to either sit in a pocket or be clipped directly to a shirt or jacket. The way it works is simple: you plug your traditionally-wired headphones into the 3.5mm headphone jack, then pair the GET with your phone – a process that worked flawlessly, and took seconds. Then all you need to do is start listening. As we said, this isn’t a new concept. Miniature portable amps have been around for a long time, with models like the Creative Sound Blaster E1 dominating. But Bluetooth amps are still quite uncommon, and rarely have they been done with so much charm, or in such an intuitive manner. The GET is light – no more than an ounce – and its controls are an absolute joy to use. A single circular button controls everything from playing and pausing the music to answering calls, while two arrows skip tracks and fast forward/rewind. Unlike on many portable amps, they are easy to find without looking, with a shape that is distinctive enough and raised above the housing enough to make sure you never push the wrong button. The circular one even doubles as an on/off switch, and pairing is automatic as long as the device is switched on and your phone is looking for it. While the GET doesn’t have the slick construction of something like the cheaper (by $75) FiiO BTR1, and while it doesn’t look particularly special, the robust and cheerful design is satisfying enough. There’s a real sense that this is just the first iteration of a product that is only going to get better and better, and it’s promising that they got so much right first time. While there’s definitely room for improvement, we had very little issue with the design of the GET. Bluewave offer a one-year warranty on parts and labour, plus a full refund if you don’t like what you hear. On one side, there’s an LED and an analog volume wheel – which we’ll talk about in a sec – and on the other, there is a micro-USB charging socket, and the headphone jack. It’s the wheel that we thought let down the design slightly - but in a way we didn’t expect. Initially, we felt it was a joy to use: an intuitive, friendly way to adjust the volume. That’s more important than it sounds with an amp this small, where functionality is sometimes sacrificed for size. However, we soon discovered that it had a problem. The wheel’s travel is smooth, not requiring a huge amount of pressure to adjust, but the problem is that the volume stays at whatever position the wheel is left at – regardless of whether the GET turned itself off or not. If you’ve left this knocking around in a pocket, or a bag, and turn it back on again without thinking to look at the volume wheel, it’s easy to find that it’s turned itself all the way down to zero – or all the way up to maximum volume. We can say from experience that this is only a mistake you’ll make once. It’s a simple thing, but it does let down the design slightly - especially since a wheel with an infinite scroll and a digital volume control would have been a much better solution. If you want one, check out the M-Audio Bass Traveler - at $28, it’s also about $100 cheaper than a GET. Although, the sound isn’t nearly as good. Battery life was good, too. Bluewave advertise six hours of use at maximum power, and we got close to this, with the unit dying at around five and a half. At a more reasonable volume, we cranked out seven and a half hours of music before it conked out, which is very respectable. Far more expensive models, like the old Peachtree Audio SHIFT, delivered maybe an hour more - and that one costs about $329, an easy $200 more expensive than the GET. Good job, Montreal. At the time of writing, we didn’t have a box for the GET – we were given it at a trade show, remember – and Pierre told us that a final version hasn’t been settled on. We’ll update this when it has. The only other accessory the GET ships with, as standard, is a simple micro-USB charging cable. Which, when you think about it, is all you need. The GET also works while charging, which is a handy feature. There is, however, an intriguing accessory option available, if you’re willing to spend an extra $12. It’s an oversized clip, which you can use to replace the existing one on the GET, and fasten to either the left or right hinge of your headphones. The clip ships with a short 3.5mm-to-3.5mm cable, presumably so that you don’t have a huge length of wire dangling off your head. We haven’t tested this yet, and we can’t confirm how well it works or not, but we do have misgivings. As light as the GET is, many high-end headphones already flirt with being a little bit too heavy, and having an extra thing hanging off your head might be a bit much. All the same, we’ll reserve judgement here. If nothing else, it’s an interesting idea. The Bluewave GET has effortless functionality, and intelligent design. 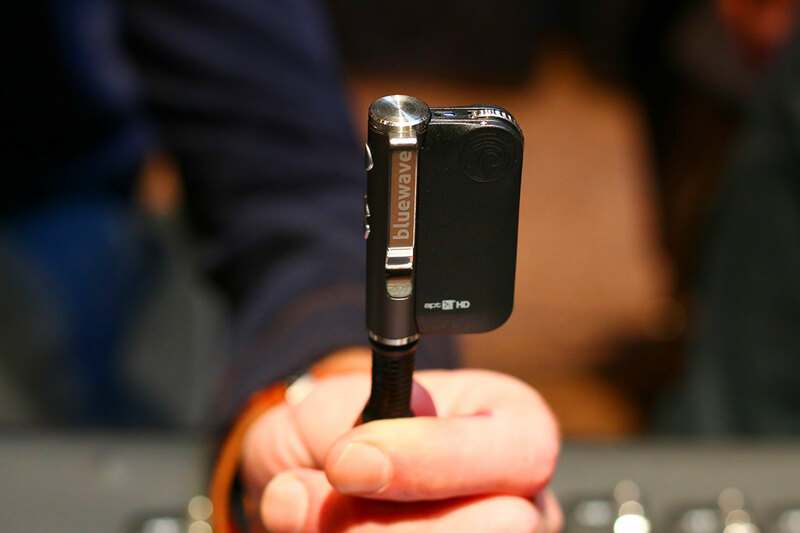 We really like the sound signature, which dramatically boosts and sharpens the source audio. ​The amplifier is capable of powering just about any headphones. We had issues with the volume wheel on the GET, which doesn’t work very well. It’s arguably a touch expensive for what you get. ​The GET feels very much like a version one, which is because it is. Subsequent editions should fix the problems, we hope. If the GET is the craft brew, then the FiiO BTR1 is the mass-market lager. Perhaps that’s a little bit of an unfair comparison, because we do like this tiny little amp/DAC. After all, most mass-market lager is still eminently drinkable. The BTR1 is actually very similar to the GET, and a little bit cheaper, too - around $50 to the GET’s $129. We prefer the volume control on the GET, despite the issues we had with it, and it definitely has a charm that the BTR1 lacks. However, this is a very viable alternative, and it comes from a great brand known for reliability and quality. However, it's worth noting that the GET is able to handle much more power-hungry headphones, up to 600Ω, compared to the BTR1's 100Ω. Then there’s the Creative Sound Blaster E1. It’s as old-school as they come: the grandad of the portable amp/DAC world. The Sound Blaster E1 looks like it comes from the 1990s, but it’s still going strong, with plenty of devoted fans. There’s no Bluetooth, although you do get a microphone, as well as twin headphone jacks. To be honest, the BTR1 and the GET both better options, but this is a good standby. It also has a massive 25 hour battery life, compared to the GET's 5.5, and is significantly cheaper. $43? Come on. M-Audio are usually better known for making professional audio goods, but their Bass Traveler is still pretty popular – albeit nothing on the much better GET. It offers decent power, twin headphone jacks, and a superb battery life. We also really like the design, which is simple and effective. If both the FiiO and the GET are out of stock, and you don’t feel like time travelling back to the 90s with the E1, go for this one. It’s also the cheapest model here, at $29, compared to $129 for the GET. Bluewave only makes one product right now, so let’s mention a final alternative. This is another FiiO, the Q5. It’s a beast: a silver slab of power that slips into a pocket and has a huge feature set. You get full aptX Bluetooth, swappable amp modules, great controls, and unbelievable sound. You will also spend a lot more - it costs nearly three times the GET’s $129. But it’s great if you want to get serious. The Q5 is good, but we really, really liked the Bluewave GET. It doesn’t do anything revolutionary, or anything that hasn’t been done by other products before. But it is so charming, so easy to love and so intuitive to use, that we couldn’t help but enjoy it. In the time we’ve had it – and they generously let us take it home after the show to continue testing – it’s integrated itself effortlessly into our daily life. Being able to wirelessly control your music without having to pull a phone out of a pocket makes a huge difference. It’s clear that this is only the first version of a product that is destined to improve significantly over the next few years. There are almost certainly going to be many design iterations after this one, as well there should be. It’s a product with at least one real flaw – the volume wheel – and while we like the looks, we can totally understand why some wouldn’t. But for $129, we think this is one of the best amplifiers available right now. It’s a tiny little powerhouse that is much better than it has any right to be. FiiO and their brethren should be very worried indeed. Let’s get one thing out of the way first. We solemnly swear that in this review, and in all future reviews, we will not make any jokes, puns, bon mots or witty jibes at Schiit Audio’s name.